Today is the day when members of the Facebook event 10eleven12 (organised by Andy Campbell), have been charged with finding a moment of inspiration and contribute a photograph, poem, blog post or other creative work and share it with other members in the group. As fate would have it this day is also the anniversary of Carl Sagan's birthday. I've had a blog brewing for a while and as Sagan was executive director in the Voyager Space Program... it seems fitting that today I write it. A couple of weeks ago I had the privilege of watching Voyager: To the Final Frontier - a BBC4 programme featuring as part of the channels Big Science season. I've always held something of a fascination for the Voyager program - the ongoing story of two late 1970's space probes that were sent to analyse the Solar System's outer planets and having accomplished their mission, continue onwards through the void of local space on a new mission to become Earth's first interstellar spacecraft... and now in 2012 they (particularly Voyager 1), are on the verge of achieving this. I believe those of us born in the 1970's can consider ourselves "Children of Voyager", we are the Star Wars generation - always looking outward from the desolate sands of this Tatooine... imagining what a brighter and more exciting future could await us if only we could break free of our restraints and limitations. When the Voyagers launched, I was merely an infant making my own first discoveries at the tender age of 2... I had already experienced my first major setback in life and was just literally getting back on my feet - though really, how many of us remember much from those first chaotic years as our brain begins to make sense of itself and define who we are? Having a relatively contemporary timeline to the Voyager program, has caused me to think that perhaps we share something in common with those two mechanical space emissaries. Like the probes, our journey begins at the same source... we emerge from the womb and begin our journey of exploration through life. 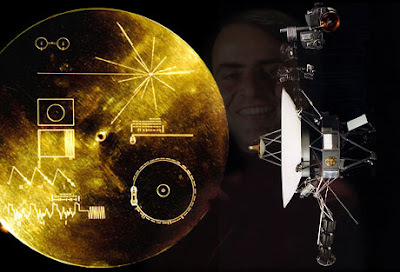 The Voyagers both have golden discs attached to them which give hints and clues to anybody who should happen upon them about our diverse cultural heritage, our nature, our values, an invitation to discover us and directions on how to find us. "All this is from God, who reconciled us to himself through Christ and gave us the ministry of reconciliation: that God was reconciling the world to himself in Christ, not counting people’s sins against them. And he has committed to us the message of reconciliation. We are therefore Christ’s ambassadors, as though God were making his appeal through us. We implore you on Christ’s behalf: Be reconciled to God. God made him who had no sin to be sin for us, so that in him we might become the righteousness of God." Another way we are like the Voyager probes is that we take different journeys based on what our Creator plans for us. Voyager 1 and Voyager 2 are in completely different locations in space... this is because NASA decided to send Voyager 1 off to investigate Saturn's largest moon, Titan. This meant that the probe missed out on journeying to the other outer planets with its counterpart. For 10 years Voyager 2 continued throughout the Solar System recording data on Uranus & Neptune... and all this time Voyager 1 drifted in darkness encountering no planetary bodies at all. Sometimes I think we can look at our lives and think we are drifting through nothingness. We see our friends and counterparts living active lives and being used for God's glory while we seem to be doing nothing... but really we are foolish to do this, it isn't a race and our journey is unique and not a carbon copy of anybody we encounter. In fact after his resurrection, Jesus gently rebuked the apostle Peter for enquiring after the future fate of John in comparison to his own. We may drift in silence, but God has a plan for each one of us and our moment will come... perhaps at an hour we do not expect. What became of Voyager 1? Did its mission end after it shot away into the darkness beyond Titan? Entitled "The Pale Blue Dot", the photograph depicts a single pinprick of blue riding on a single sunbeam of solar wind. 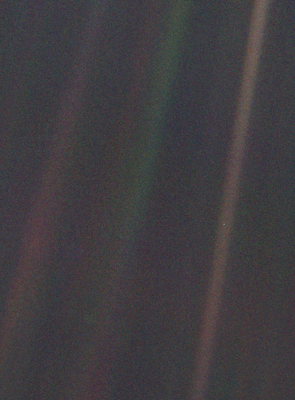 That dot is us... all of us. Voyager 1 may have missed out on many of the encounters that Voyager 2 experienced... but it had its own special moment of glory. When you see people around you living out the joys and experiences you feel you are missing out, have faith that your moment will come... your trajectory is your own and your own experiences will have just as much value in the long run. “For a long time I have kept silent, I have been quiet and held myself back. But now, like a woman in childbirth, I cry out, I gasp and pant. I will lay waste the mountains and hills and dry up all their vegetation; I will turn rivers into islands and dry up the pools. I will lead the blind by ways they have not known, along unfamiliar paths I will guide them; I will turn the darkness into light before them and make the rough places smooth. These are the things I will do; I will not forsake them." I used to think the imagery in that passage was quite strange until I looked at what the end result of the actions described would be. Mountains and rivers mark the natural borders of kingdoms... the barriers that impede and prevent us from passing from one place to another and keep us confined within a sandbox. When God takes down the mountains, dries up the rivers and burns up the briers, he removes the obstacles that prevent us from heading off into new and exciting territories. There is however a cost.... and again it is a cost that the Voyagers share in their journey. As they traverse the area of space at the very edge of our Solar System known as the Heliosheath, the Voyagers are to all intents and purposes blind; they aren't passing any known physical objects and so there cameras are deemed to be of no further use. To maximise their working life and to prepare them for that final step beyond into interstellar space, NASA shut off the probes' cameras to conserve battery power. we can't waste energy looking back at where we once were, or looking across at our neighbour and observing how successful they are. If we want the darkness before us to turn into light, we have to shut off our over analysing cameras and paradoxically submit ourselves to a kind of blindness. for God says that He "will lead the blind by ways they have not known". How can He do this if we resist it by turning our gaze elsewhere? Finally I want to take a look at the fantastical. We don't know what awaits the Voyagers once they disappear into the night, but science fiction offers us some tantalising (if far-fetched) possibilities. In the 1984 film Starman, Voyager 2 is encountered by an alien race who in response send an emissary of their own with miraculous powers, to walk about among us and learn from us. As we journey deeper into our relationship with God, it opens up more areas of our life for his Holy Spirit to enter and testify to the others around us about the presence and love of God. In the film, Voyager 6 became the entity known as V'Ger. It was programmed by NASA to "learn all that is learnable and return that knowledge to the creator". However V'Ger didn't simply want to hand over its notes like a good schoolboy; it wanted to be united with its Creator. As we move through life in our walk with Christ, we should be striving for the same thing. That on the final day when we have learned all that we can, loved as unreservedly as we can and fulfilled all that was asked of us we shall be called Home into full union with God... no longer seeing a reflection in a mirror but seeing face to face; no longer knowing in part but knowing fully... as we are fully known. Learn more about the Voyager program here.